Photo credit: HighwayWilding.org/Handout/QMI Agency. 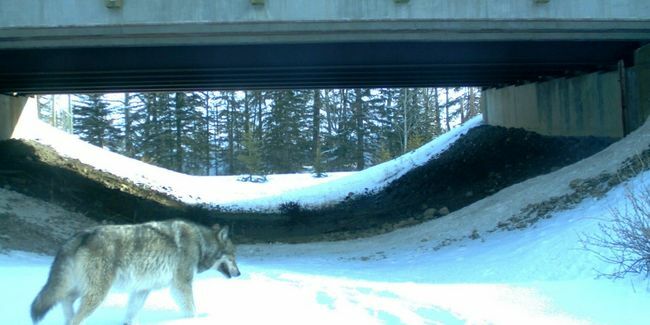 A Wolf at a wildlife crossing under the Trans-Canada Highway outside Banff, west of Calgary, Alta. Studies show these underpass tunnels improve human safety by reducing the number vehicle collisions with wildlife. It’s saving a significant amount of cash and presumably lives. That’s what a new study has shown about a wildlife underpass in Dead Man’s Flats, southeast of Canmore. Installed in 2004, the crossing structure, which includes about 3 km of fencing along a section of the Trans-Canada Hwy., has reduced the average number of wildlife-vehicle collisions from 12 per year to three. The Highway Wildlife Mitigation Opportunities for the Trans-Canada Highway in the Bow Valley report by the Miistakis Institute and Western Transportation Institute (WTI) also showed the underpass reduced the average annual cost to society of wildlife-vehicle collisions from $129,000 to $18,000. “It ends up paying for itself,” said Tony Clevenger, a wildlife biologist with WTI and co-author of the study. The structure and fencing, which cost approximately $1.5 million, was paid for by the G8 Environmental Legacy Fund. A vehicle-deer collision has an approximate cost of $6,600 to society while a crash with an elk is $18,000 and a moose is more than $30,000 said Clevenger. But the money isn’t the only benefit. “It’s also important because it shows that the crossing structures and fencing are not only protecting motorists, but also conserving wildlife,” he said. Trevor Kinley, a road ecologist with Parks Canada, said officials have been pleased with the success of the dozens of structures in Banff National Park, the first of which were installed in 1983. Over the years, even very sensitive species such as lynx and wolverines have slowly begun adapting to them as a means of crossing the highway. Since the park began closely monitoring the use of the structures in 1996, approximately 6,000 wolves, 5,000 bighorn sheep, 1,500 cougars, 1,000 grizzly bears and 14 wolverines have been counted crossing. Kinley said study results from the Dead Man’s Flats site are encouraging, because it’s likely a similar story for Banff’s structures. “It’s really good to have it quantified,” he said. Several other places along the Trans-Canada in the Bow Valley have been identified as potential sites for future crossing structures where current annual costs due to wildlife-vehicle collisions are in excess of $20,000.